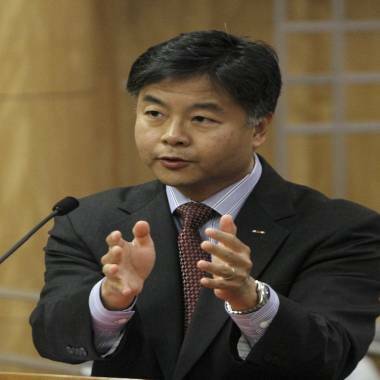 California state Sen. Ted Lieu, D-Torrance, sponsored the bill to ban a controversial form of psychotherapy aimed at making gay youth straight. Updated at 12:34 p.m. ET: California has become the first state in the nation to ban therapy that tries to turn gay teens straight. Gov. Jerry Brown announced Sunday that he has signed Senate Bill 1172, which prohibits children under age 18 from undergoing “sexual orientation change efforts.” The law, which goes into effect Jan. 1, prohibits state-licensed therapists from engaging in these practices with minors. "Governor Brown today reaffirmed what medical and mental health organizations have made clear: Efforts to change minors' sexual orientation are not therapy, they are the relics of prejudice and abuse that have inflicted untold harm on young lesbian, gay, bisexual and transgender Californians," Clarissa Filgioun, board president of Equality California, said in a press release. The bill was sponsored by Sen. Ted Lieu, D-Torrance, who said bogus and unethical practices by mental-health providers to try to change a young person’s sexual orientation have resulted in irreparable psychological and emotional harm to patients. "I am deeply honored Governor Brown signed SB 1172. The bill is necessary because children were being psychologically abused by reparative therapists who would try to change the child’s sexual orientation. An entire house of medicine has rejected gay conversion therapy. Not only does it not work but it is harmful. Patients who go through this have gone through guilt and shame, and some have committed suicide," Lieu told NBS News in a telephone interview on Sunday. Lieu called "gay cure" therapy "quackery" and said parents were never informed of its potentially dangerous aftereffects. Supporters of the bill included several lesbian and gay-rights groups and mental health associations. The National Association for Research & Therapy of Homosexuality (NARTH), a group of therapists who believe sexual orientation can be changed, opposed the bill. It said Lieu’s claims of widespread harms to minors are not backed up by scientific research. In a statement, NARTH said plans to seek a temporary injunction against the law. Meanwhile, other states have inquired about the legislation. In New Jersey, Assemblyman Tim Eustace, an openly gay Democrat, said he plans to introduce legislation to outlaw conversion therapy for minors in his state.